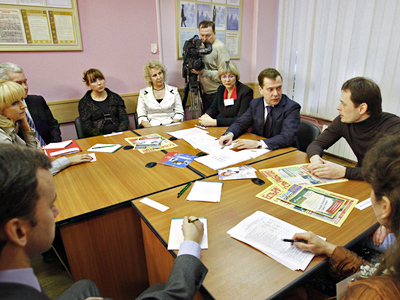 President Dmitry Medvedev has pledged support for state unemployment programs. At the same time he noted the positive changes, saying that the unemployment rate has almost reached pre-crisis level. ­On Friday, he visited one of Moscow’s job centers, where he held a meeting on the issue. Mededev added that Moscow stands out in terms of employment as compared to other regions of Russia. In the capital the situation is “rather calm” he said. The official unemployment rate there is 0.7 per cent, while the country’s average is 6.9 per cent. He also got familiar with the center’s daily routine and tried a job search database, which he found “rather handy” and easy to use. As a lawyer himself, he of course searched for legal jobs but was disappointed not to find many. Indeed, white-collar professions are now in less demand than low-qualification ones.